We’d love your help. 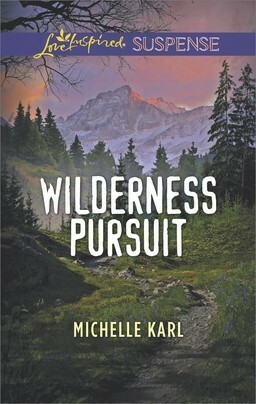 Let us know what’s wrong with this preview of Wilderness Pursuit by Michelle Karl. To ask other readers questions about Wilderness Pursuit, please sign up. Non stop action! The bad guys are pretty much known from the beginning and they are running from them. I prefer more of a surprise but good book chock full of action! So...yeah, just the name of this series has me all twitterpated - Mountie Brotherhood. And Royal Canadian Mounted Police officer Sam Thrace is a fine hero to start things off. Blissful sigh. Karl gives us an exciting glimpse into the life of a rural RCMP officer - maybe a little too exciting! 'Cause this is what I like to call a 'rabid-reader page-turner'. Be prepared for a hair-raising life-or-death pursuit through the Canadian wilderness. Honestly, the bad guys are...shudderingly ingenious in t So...yeah, just the name of this series has me all twitterpated - Mountie Brotherhood. And Royal Canadian Mounted Police officer Sam Thrace is a fine hero to start things off. Blissful sigh. Karl gives us an exciting glimpse into the life of a rural RCMP officer - maybe a little too exciting! 'Cause this is what I like to call a 'rabid-reader page-turner'. Be prepared for a hair-raising life-or-death pursuit through the Canadian wilderness. Honestly, the bad guys are...shudderingly ingenious in their lethal plans. Which means Sam and Kara are in for the fight of their lives. These two have history of the high school kind and it's been eighteen years since Kara left their small community to attend university. Sam thought they had something special back then but this is the case of two people who might be good with each other needing to grow up before they can be good for each other. Nearly two decades later their explosive reunion kicks off a series of events that forces them to work together in order to survive. Kara's a hard-hitting professional used to making herself heard in a male-dominated profession and Sam can't seem to turn the macho protector off. These two grate on each other - and Kara can be biting in her bid to stand her ground. Great dynamics between these two! The romance is as nail-biting as the suspense! And an added bonus -- Kara is Korean Canadian. I really can't express how thrilled I am to see more diversity in the Love Inspired lines. So if you like plenty of action, wilderness survival and a Mountie riding to the rescue (literally) this is a definite must read. My review today is on the Love Inspired Suspense, Wilderness Pursuit. This is the first book in the Mountie Brotherhood Series. This is a Great Read. This book is well written, fast pace, and action packed. I know that you are going to love it. Archeologist Kara Park is hired to check out the dig site for the Gaida Industries new pipeline. According to the law in Canada they must make sure they're not digging up possible archaeological remains. She decides to come early to take pictures and prepa My review today is on the Love Inspired Suspense, Wilderness Pursuit. This is the first book in the Mountie Brotherhood Series. This is a Great Read. This book is well written, fast pace, and action packed. I know that you are going to love it. Archeologist Kara Park is hired to check out the dig site for the Gaida Industries new pipeline. According to the law in Canada they must make sure they're not digging up possible archaeological remains. She decides to come early to take pictures and prepare for her team's arrival. The foreman tries to talk her out of going to the site claiming bad weather but she's determined to check out the site. She's taken out to the site by the foreman. They are walking the site when they are attacked. She is rescued by a Mountie. The Mountie turns out to be the only man she has ever cared about but had left behind. Royal Canadian Mounted Police Officer Sam Thrace rescues his former sweetheart. If Kara hadn't run off to college and left him he wouldn't be the man he is today. He goes with her to the site the next day only to be attacked and abducted. They are put in an old trailer out in the middle of nowhere. They escape but are hunted down. Can he keep them safe and find out what is going on? 3.5 stars. Sam & Kara. RCMP & archaeologist. I wanted more from this book. Good potential..but the plot didn’t hold together very well. Liked learning about BC, Canada. There was a bad typo near the end of the book too- in a crucial sentence. Unfortunately the romance didn’t quite click for me either. As always, Karl packs a lot of information and action into her books and this one takes the cake for information overload. I was a little bombarded with information about Canada and how the police work, the wilderness, archeology, etc. Although I am a Canadian and I enjoy learning more about our wonderful country, I felt that the explanations took me away from the story. There were plenty of action packed sequences where our heroes could hardly take a deep breath... except to explain their areas As always, Karl packs a lot of information and action into her books and this one takes the cake for information overload. I was a little bombarded with information about Canada and how the police work, the wilderness, archeology, etc. Although I am a Canadian and I enjoy learning more about our wonderful country, I felt that the explanations took me away from the story. There were plenty of action packed sequences where our heroes could hardly take a deep breath... except to explain their areas of expertise to each other in long-ish monologues. -The strong and capable woman is all of a sudden in danger and the man in some sort of law enforcement position wants to/needs to protect her. -The characters get out of dangerous situations “coincidentally” (i.e. protected by God). I do enjoy this theme, however when it is overly used in novels it makes me feel so sad that God doesn’t normally work this way and makes me grieve for the suffering of good people out there.